Our range of products include cotton ladies suit, patiyala vol.-9 of rani print, ladies suit, ladies suits, digital printed with embroiderd suit and long suit. Cotton Ladies Suit offered by our organization can be availed in vibrant colors, alluring designs and patterns at most economical prices. To deliver an optimum quality collection, these suits are manufactured in line with the modern fashion trends and are thoroughly checked by our quality experts against industry set quality parameters. Further premium packaging material is used to pack these suits for a safe delivery to the client’s premises. Owing to our in-depth industry knowledge and experience, we are capable in manufacturing a beautiful collection of Patiyala Vol.-9 Of Rani Print to our prestigious clients. These products are designed and stitched by our expert professionals utilizing ongoing technology by keeping track of the latest fashion trends. Our offered collection of these products are also packed properly by our packaging experts to ensure safety during transit. These products can be easily available with us at budget friendly price. We are among the reputed organizations; indulge in providing a wide range of Ladies Suit in the market. Designed in compliance with globally accepted fashion trends, these suits are available in a many attractive designs and patterns at industry leading prices. With the help of a team of quality experts, regular quality test performed on all the suits to assure zero defects at clients end. In addition to this, our clients can avail these suits from us in proper packaging options. 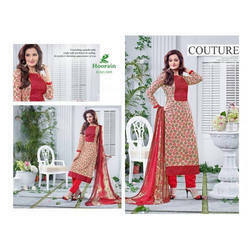 Our organization is highly specialized in offering a wide assortment of Ladies Suit. Our offered arrays of suits are manufactured from supreme quality materials under the guidance of our highly skilled and talented professionals of the domain. The offered suits are available with us in a number of sizes, creative designs and colors. Offered suits are beautifully designed by using modern and sophisticated techniques in well-equipped designing unit keeping in mind the latest trends.